Big games are won with big plays. When the playoff bracket is trimmed to the top teams in the state, the matchups become impossible to predict on paper. The contests that count often come down to the variables: momentum, perseverance, stepping up in the clutch. The Bulldog football team saw that proven last week in their Class 5A quarterfinal bout with St. Pius. And with just over 12 minutes remaining Saturday in a semifinal showdown with Piedra Vista, the gauntlet was lain again. Holding a one-touchdown lead, 35-28, the ‘Dogs had just fumbled deep in Panther territory. Having scored only moments before, the volume was rising from the Piedra Vista half of the field. Artesia needed the Orange Crush to stop the tone from shifting. 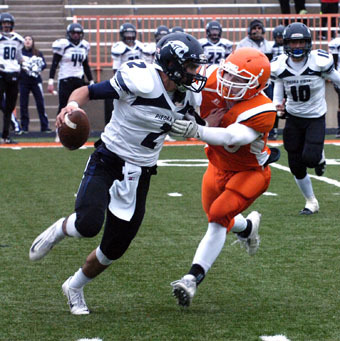 On the Panthers’ second play from scrimmage, linebacker Grady Frost charged into the backfield, snagging PV’s Elijah Gamboa and swatting the ball from the quarterback’s hands. Sophomore safety Denver Williams spied the loose ball and scooped it up, returning the ball to the Bulldogs at the Piedra Vista 18-yard line. Now, it was the offense’s turn. As the final seconds of the third quarter ticked away, senior QB Justin Houghtaling continued his dual-threat day, darting through the Panther defense for an eight-yard run. 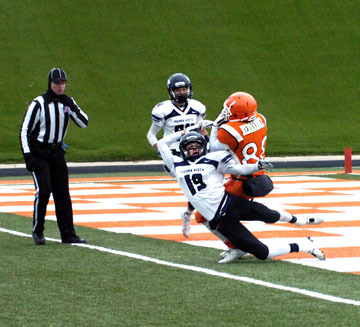 And seven seconds into the fourth, he found Chaz Matthews for the score to bump Artesia’s lead back to 14, 42-28. PV wasn’t about to throw in the towel, however. Gamboa had come up with a number of big pass plays of his own over the course of the contest, and he launched the Panthers into the Bulldog red zone with another, a 31-yard toss to receiver Casey Simmons. From there, it looked as though the Artesia D would hold, but on fourth and eight from the 11, Gamboa connected with Simmons again to pull PV back within a touchdown, 42-35, with 7:56 remaining in the game. The ‘Dogs appeared poised to answer seconds later after Houghtaling hit Isaiah Weideman for a 34-yard gain that set Artesia up at the PV 18. But as Houghtaling went out of bounds near the PV sideline after scrambling to avoid a sack, a fumble was ruled despite the QB appearing to be down. The Bulldogs weren’t out of the woods just yet. 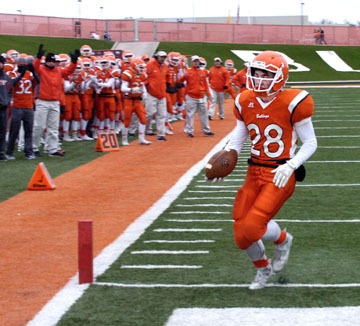 Gamboa proceeded to lead the Panthers from their own 27 to the Artesia 34, legging out 32 of those yards himself. A top for no gain, an incomplete pass, and a short pass, however, brought about fourth and seven, and Gamboa attempted to air out a first down… within range of senior corner Carlos Carrasco. In other words, a no-fly zone. Carrasco picked the pass and proceeded to dart 76 yards to the end zone, but the score was negated by a personal foul flag behind the play. But starting at the Panther 27 with 1:59 to go, the turnover was sufficient to allow the Bulldogs to run out the clock on their 11th win of the season. 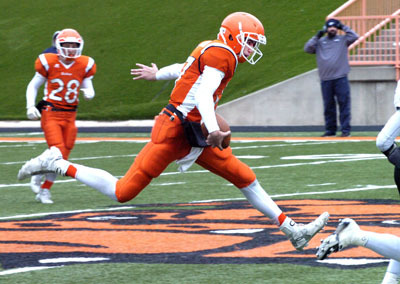 “We’re really proud of our football team today,” Artesia head coach Cooper Henderson said Saturday. “Our goal since the first of the year, like it is every season, has been to be a state champion, and now we’re down to playing the game that allows you to reach that goal. Piedra Vista got on the board first in the contest, marching from their own 12 on 11 plays, the last a two-yard touchdown run by Gamboa with 5:34 left in the opening quarter. The ‘Dogs needed just over two minutes to respond. Houghtaling found Daniel Hernandez for a 37-yard pass to start the drive, and after a pair of carries for 24 yards by Robert Fernandez, Weideman covered the final five, scoring from the three to tie the game. A 63-yard pass from Gamboa to Simmons, however, put the Panthers back on top, 14-7, with 1:31 on the clock, and that score would carry into the second quarter. 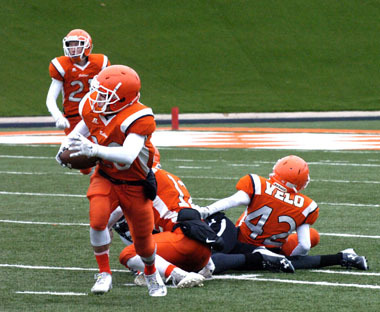 Four plays later, the deadlock was reinstated, as Duff took the handoff on the end around and sprinted untouched into the corner of the end zone. And after the Crush forced a three-and-out, the ‘Dogs drove 66 yards on eight plays to take their first lead of the day, 21-14, on a two-yard plunge by Houghtaling. 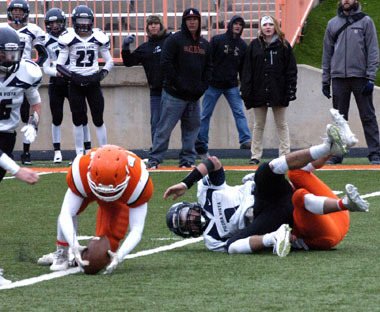 A 44-yard field goal attempt by the Panthers as the half fell under 1:30 dropped short, and Artesia looked to have secured a 14-point halftime lead following a 30-yard scoring pass from Houghtaling to Weideman at the 32-second mark. But a letdown on special teams cost the Bulldogs, as Piedra Vista’s Alex Shay took the ensuing kickoff 90 yards to make it a seven-point game, 28-21, at the break. 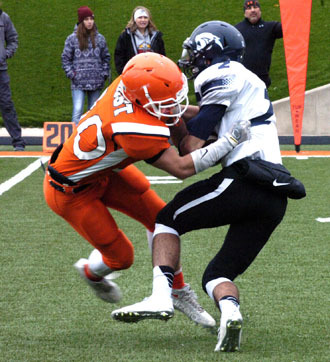 Artesia’s defense facilitated another quick punt to start the third, and the ‘Dogs were able to reclaim their two-score edge, 35-21, on a 28-yard toss from Houghtaling to Daniel Hernandez, who hauled in the pass between a pair of Panther defenders. Another three-and-out left the door open for more damage, but an unsuccessful punt fake by the Bulldogs near midfield gave PV the ball at the Artesia 49. Gamboa and Shay traded rushing duties from there en route to a two-yard touchdown by the former with 4:23 to go in the third. 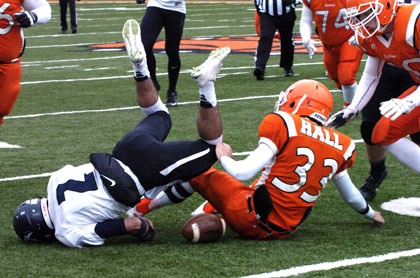 The traded fumbles followed soon after to set the dramatic fourth-quarter stage. The Bulldogs finished the afternoon with a whopping 523 yards of total offense to the Panthers’ 388, 325 of those through the air and a season-high 198 on the ground. Houghtaling was 16 of 26 passing for 325 yards and three touchdowns and carried the ball nine times for 67 yards and one score. Fernandez was 10-60 rushing, and Duff and Weideman went 5-49 and 7-20 respectively with a touchdown apiece. Daniel Leon led the receiving corps with four catches for 97 yards, and Hernandez was 5-90. In special forces play, Duff logged 70 yards on three kick returns, Tristan Bowden punted once for 41 yards, and Tanner Harris was a perfect 6-6 in PATs. Gamboa was nine of 18 passing for 165 yards, two touchdowns, and one INT for Piedra Vista (9-3). The standout junior rushed 21 times for 118 yards and two TDs but was sacked four times on the day by the Crush: twice for a combined loss of four by Cooper Hall, once for a loss of two by Codey Scott, and once for a loss of one by Frost. “We felt like this was a team effort,” said Henderson. “We definitely had all three phases of the game make some plays, as well as the sideline helping us achieve our goal today of winning a semifinal game. The Bulldogs will now have a week to prepare for an anticipated matchup with top-seeded and unbeaten Centennial. 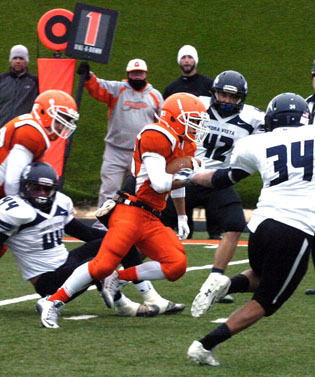 The Hawks bested Moriarty 42-0 in their semifinal Friday evening. “Anytime you can make it to the state championship, you know you’re in for a big test, and we’ll be working real hard this week preparing for that game,” Henderson said. Kickoff is set for 1 p.m. Saturday, Dec. 5, at the Field of Dreams in Las Cruces.